The Syracuse University Mobile app offers a wealth of current information about the University, and it provides safe, secure access to information in MySlice. Earlier this year, Chancellor Kent Syverud appointed Whitman School Associate Dean of Undergraduate Programs and Professor of Retail Practice Amanda Nicholson to lead an initiative aimed at generating ideas and input from students to create new communications tools for the University to better connect with students. Nicholson used that platform to initiate two ICE (Involvement. Communication. Education.) Tournaments, which involved teams of students, staff and faculty. Each team was tasked with developing innovative ideas to increase student engagement. One idea is now a reality—thanks to the hard work of Information Technology Services (ITS). 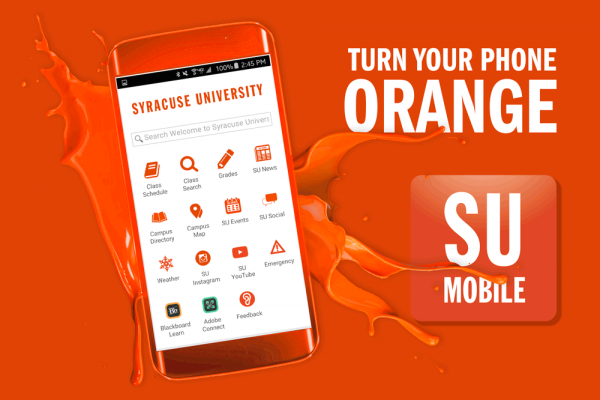 Today, ITS announced the launch of its new mobile application, Syracuse University Mobile, which is available free in the Google Play store and Apple App store. The Syracuse University Mobile app offers a wealth of current information about the University, and it provides safe, secure access to information in MySlice, a feature students overwhelmingly said is critical. The app also enables students to view their class schedules and grades, and search for classes. The app delivers the latest University news and events and provides access to the University’s online directory to search for students, faculty and staff; campus maps; interactive SU social media; and more. “As a student who is constantly moving between different buildings on campus, the convenience of easily checking my phone for my class schedule, or looking up an email address on the directory, is incredibly useful,” says Justin Baumann ’16, a political science major, with a minor in information management and technology, and director of technology for the Syracuse University Student Association. Rhoads also likes the News feature. “The more I keep opening up the News feed, the more stories I find interesting and want to read,” he says. Sam Scozzafava, interim chief information officer and vice president of ITS, says the mobile app delivers important information and content in a reader-friendly form to mobile devices and tablets. “With a rich mix of University information and personal services data, the app will help users engage sooner and easier with the institution and its faculty, staff and students. We will continue to engage students to identify and implement enhancements to ensure it’s serving their needs and providing them with the necessary tools and information to help them be successful in their academic career,” says Scozzafava. As with all mobile apps, updates and enhancements are constantly being deployed. You can download the free SU Mobile app in the Google Play store and Apple App store.